A Noh Christmas Carol returns! 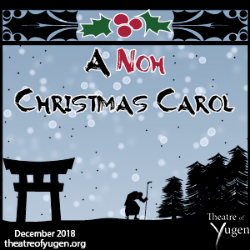 Yugen’s beloved adaptation utilizes the traditional Japanese theatre forms of noh, kyōgen, kabuki, and the avant garde dance form butoh to retell the Dickens classic. The story is transposed to early Meiji era Japan, the parallel period to Victorian England. Ebezo Sukurooji [Ebenezer Scrooge] receives a visit from his deceased business partner Jakube Mashima [Jacob Marley] warning him to change his miserly ways or be doomed to linger forever as a hungry ghost. The miraculous interventions of the Ghosts of Christmas Past, Present, and Yet-To-Come take Sukurooji on a wondrous journey through time and memory to remind him of a life beyond business and profit.